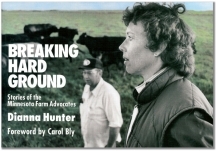 Through oral history narratives, Breaking Hard Ground tells the stories of Lou Anne Kling, Anne Kanten, Albert and Pearl Gamradt, and other activist farmers during the 1980s farm crisis. Also central to the story is the role of legal services attorneys, and most especially the legal work that led to the formation of FLAG. Jim Massey, Lynn Hayes, Randi Roth, and Susan Schneider tell their stories in the book, and Jim Massey comments that FLAG’s collaboration with the farm advocate program provides a model process for practicing public advocacy law. How this model program worked is explained throughout the book. During the time covered by the book (the 1980s), Lou Anne Kling directed the farm advocacy program, Anne Kanten served as deputy and assistant commissioner of agriculture in Minnesota, and FLAG attorneys provided training and advice to the farm advocates. While the book was not written or published by FLAG, essential parts of FLAG’s story are told in the book. You may purchase copies of Breaking Hard Ground by contacting FLAG at 651-223-5400.